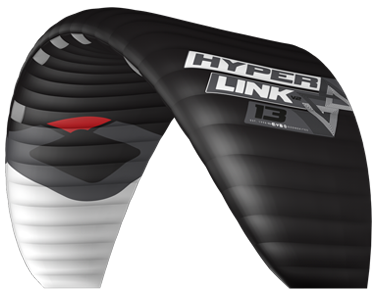 The Hyperlink V2 bridges the gap between inflatable and foil kites, it’s as dynamic and engaging to ride as an inflatable combined with the high performance characteristics of a foil. With unparalleled stability, lighter weight, improved handling and bar feeling the V2 design takes it to the next level. It excels on all surfaces, with our innovative valve design it can be set up for the water, snow and land, as a Closed Cell or Open Cell kite. The Hyperlink V2 features an all-new material combination with a durable, airtight and lightweight double rip-stop for the upper and lower surfaces. The new material has a unique formulated coating to help shed water, improving flying characteristics and water re-launch. The Hyperlink V2 is durable and strong, while being as lightweight as the V1 Ultralight version. 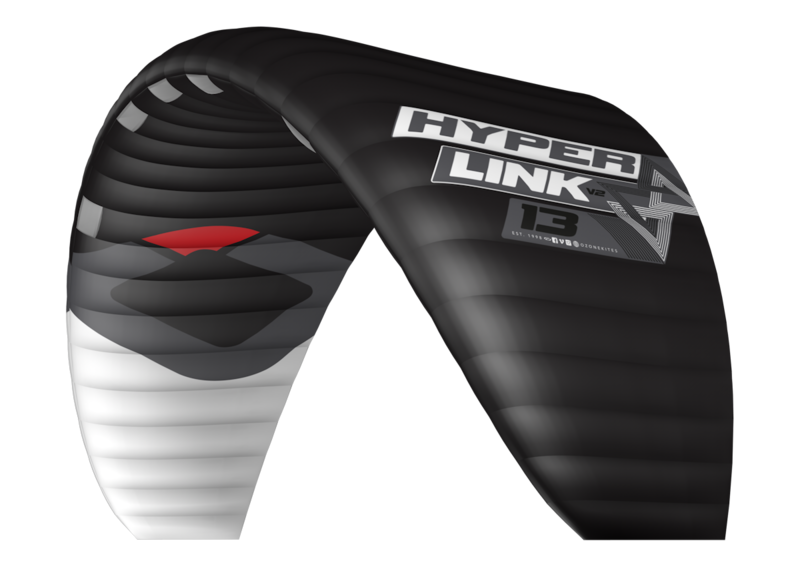 The Hyperlink V2 is a mid aspect ratio design incorporating a minimalist bridle set up, ensuring the kite is user friendly for those taking the leap from inflatable to foil kites. Our latest bridle calculation enhances load distribution and combined with a new arc improves overall performance of the Hyperlink V2. The handling is sharper with a refined bar feeling that is closer to the feel of an inflatable kite. Our new valve design and position with a new internal structure increases inflation efficiency. Newly designed drainage valves at both wing tips seal to keep air in, and open up when water needs to drain out. The ability to safely self-land a kite on the snow or land is a crucial feature when adventuring the backcountry or high mountain areas. 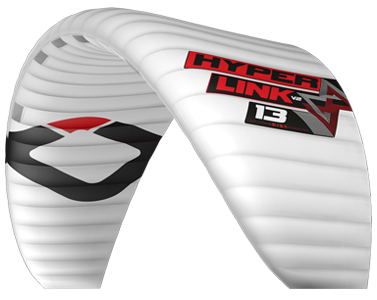 We have completely re-designed the Hyperlink V2 internal structure and inflate valves to incorporate our industry leading Internal Re-Ride Release System – the same system featured on our dedicated Snowkites. A true multipurpose foil kite with a new feeling of freedom, the Hyperlink V2 covers almost every aspect of Kiting. Free ride, hydrofoil, boost and float, air style or unhooked, backcountry snow missions, you name it and it delivers! This kite features a simple yet effective front line flag out release in 4-Line Closed Cell mode. The 5-line Open Cell mode is recommended for Snow or Land use only. The air intake valves MUST be open when using 5-line mode – if the valves are not set open this will compromise the functionality of the Internal Re-ride Release System and could cause to damage to the kite. After releasing the flag out you should check the speed system, bridle lines and flying lines for twists before restart. All new improved Ultra Light material combination: durable, airtight, lightweight double rip-stop, with unique coatings to help shed water. Using Ultra Light materials translates to true performance increases - the kite inflates quicker, flies faster and is more reactive even in the lightest breeze. With our newly developed Inflate Valve the Hyperlink V2 can be easily converted between 4-Line Closed Cell and 5-Line Open Cell modes. The combination of our new valve design and position with a new internal structure also increases inflation efficiency. 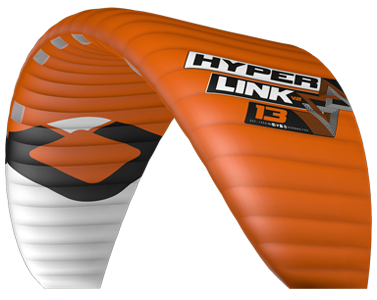 The Hyperlink comes standard in 4-Line Closed Cell Mode, utilising our Front Line Flag Out Release System. This is recommended for water use – it is a simple and effective flag out when the Quick Release is activated – it works the same way as our 4-line inflatable water kite range. The optional 5-Line Internal Re-Ride Release System Conversion Kit is recommended for snow or land use. 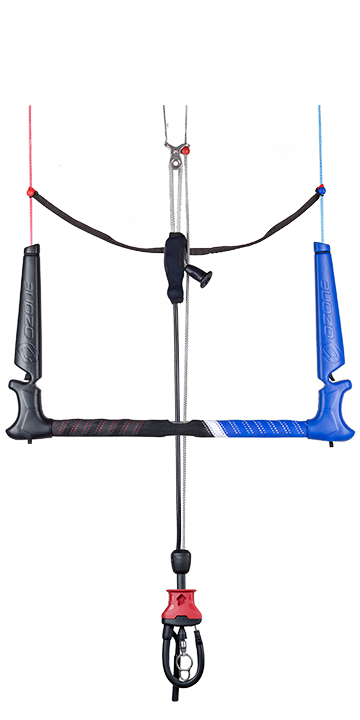 The Internal Re-Ride Release System de-powers the kite instantly without tangling, and falls to the ground to re-launch when ready. We work extensively during our R&D process on each and every kite to develop a range of sizes that feel in tune with each other. Backpack: Perfect for travelling and day-to-day protection for your kite, choose the backpack for a quick and easy pack down. Closed Cell Compressor Bag: For a secure packing process to maintain the plastic pattern profile shape. Light weight materials, internal compression straps and a breathable mesh lining keep weight and packing size to a minimum - perfect when traveling with multiple kites. Watch the video on our website for more information explaining the differences and how to use each bag. We recommend 25m flying lines as the best all-round option. Using line lengths of 20m to 23m the handling of the Hyperlink V2 becomes more responsive making jumping more direct and easier. For Hydro-foiling shorter lines (10m to 20m) are preferred by a wide range of users. You will feel an increased ‘connection’ to the kite, it will become more responsive and direct. In stronger winds with shorter lines the upwind ability will be enhanced significantly. Watch the how-to video to ensure you understand the correct method to change between 4-Line Closed Cell and 5-Line Open Cell modes. 4 Line Closed Cell Mode is recommended when riding on water. 5-Line Open Cell Mode is recommended when riding on snow or land. Similar inflation as in Closed Cell Mode, slightly quicker due to the valves being open. Snow and land riding are a blast, the easy inflation and Internal Re-Ride Release System means it can be taken anywhere safely. is True Performance Our understanding of true race performance is not only raw power and speed – it is the combination of every aspect of a kites characteristics, and most importantly how easy it is to access its full potential.